24 Jan 1944: The squadron received orders on 27 December 1943 to proceed to Ibura Field, NAF Recife, Brazil, to relieve VB-143. VB-134 departed NAS Quonset Point on 24 January 1944, with the last Ventura arriving at Recife on 8 February. Upon arrival the squadron came under the operational control of FAW-16. 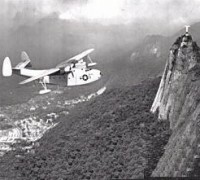 From this base the squadron conducted dawn-to-dusk coverage of convoys between Rio de Janeiro, Brazil, and Trinidad. 16 Feb 1944: A three-aircraft detachment was sent to NAF Maceio, Brazil, 90 miles south of Recife. 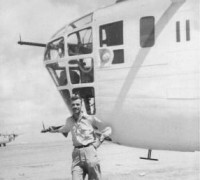 5 Apr 1944: The entire squadron joined its detachment at Maceio. A three aircraft detachment was left at NAF Recife, to assist in training the First Brazilian Air Group, also stationed at Ibura Field, Recife. 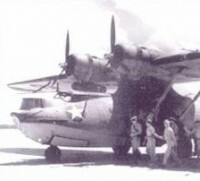 Two squadron members were among those who flew to NAS Quonset Point, R.I., to pick up new PV-1 Venturas for delivery to the Brazilian Air Group. 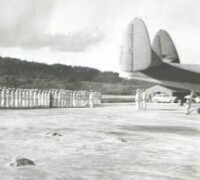 This detachment remained at NAF Recife until 26 October 1944 when it rejoined the squadron at NAF Fortaleza. 28 Apr 1944: VB-134 was relocated to NAF Pici Field, Fortaleza, Brazil. A three-aircraft detachment was sent to NAF Tirirical Field, Sao Luiz, Brazil. The detachment remained at Sao Luiz until 6 February 1945, when it rejoined the squadron at Fortaleza. Pici Field was adequate for general purposes; maintenance was the only major shortcoming. The HEDRON assigned there could conduct routine 30 to 60 hour engine checks, but the more extensive 240 hour checks, engine changes and major repairs had to be done at Ibura Field, NAF Recife. 27 Nov 1944: Ensign Charles M. Rockwell struck the surface while conducting rocket-firing training at sea approximately 15 miles from NAF Maceio. All hands except one were able to exit the aircraft without serious injury before it sank. The cause of the accident was diving at too low an altitude while firing, and running into the water spray from the rockets, ripping off the port engine and starboard propeller. Rockwell was able to recover with the remaining momentum bringing the damaged aircraft back to 200 feet, then ditching it in a controlled crash. A Coast Guard cutter standing by picked up the men within six minutes of ditching. 18 Dec 1944: Lieutenant (jg) Wolfe and his crew, and four passengers were killed on takeoff from Pici Field, Fortaleza, when his port engine exploded and the aircraft spun into the ground inverted. The crash resulted in a general squadron standdown while all of the aircraft were inspected. Several were found to have major deficiencies requiring several months to make them airworthy. 11 Feb 1945: A detachment was sent to NAF Fernando de Noronha, returning to NAF Fortaleza on 21 February to rejoin the squadron in time to prepare for the return to NAS Norfolk, Va.
1 Mar–25 Apr 1945: VPB-134 was transferred to NAS Norfolk, Va., arriving 7 March 1945.